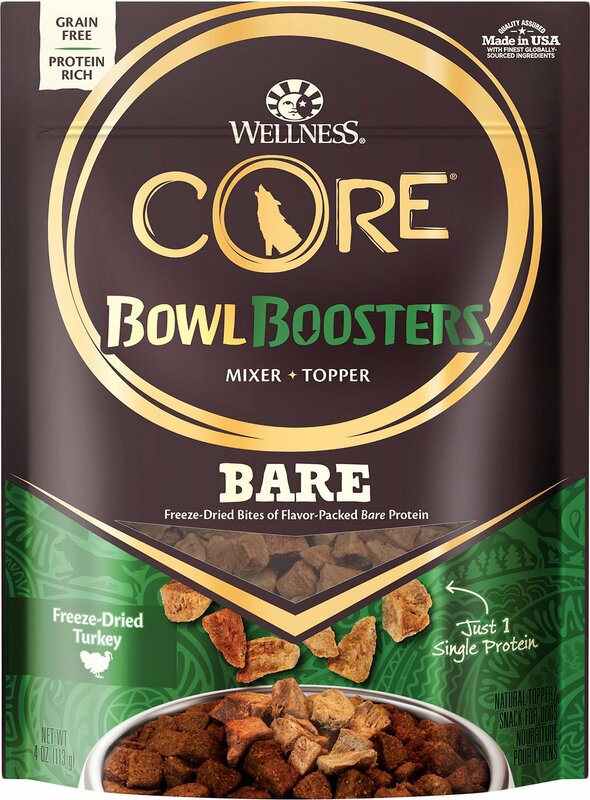 Boost your dog’s meal with extra flavor and protein with Wellness CORE Bowl Boosters Pure Turkey Freeze-Dried Dog Mixer or Topper—just sprinkle on top or mix right in! These delectable morsels can be used as a mixer, topper or snack to be added to a complete and balanced diet. They're naturally grain-free and made with only premium proteins. Plus, they're proudly made right here in the USA, and backed by the Wellness guarantee. 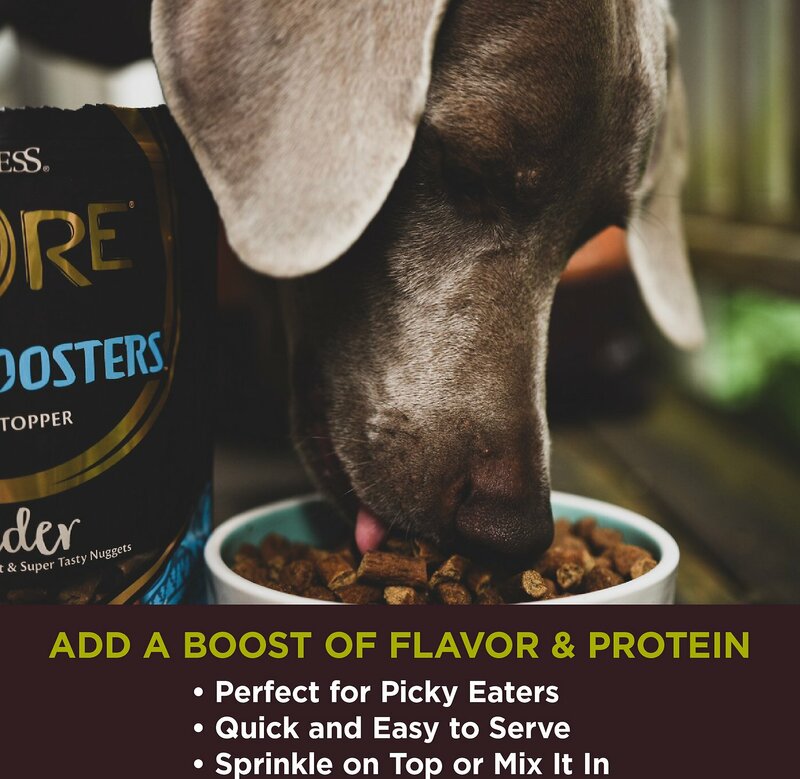 With more of the protein your pet craves and no fillers like wheat, corn or soy, it’s easy to provide the nutrition your friend needs to thrive. Can be used as a mixer, topper or snack to be added to a complete and balanced diet. Grain-free, protein-packed, freeze dried raw treats make an excellent training reward. 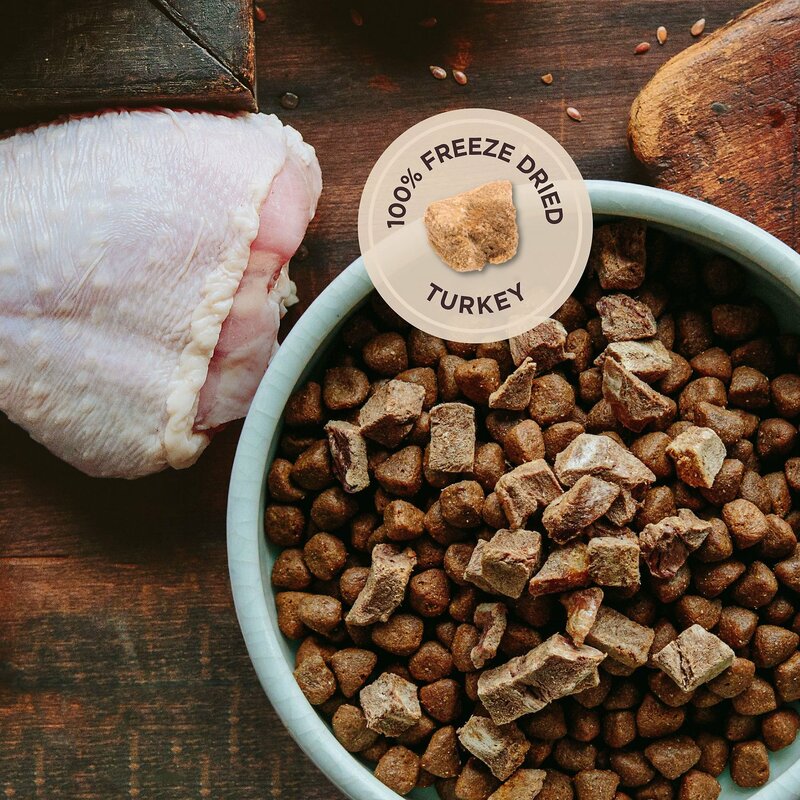 Raw, freeze-dried treats provide a convenient and safe way to introduce raw into your dog's diet. 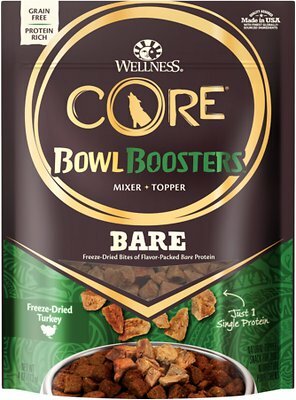 Contains only premium, all-natural ingredients with no wheat-gluten, corn, soy, meat by-products, or artificial colors, flavors and preservatives. Nutrition-packed meal is backed by the Wellness guarantee and proudly made only in the USA with ingredients you can trust. Remember to reduce the calorie amount of your current food accordingly to avoid overfeeding. My dog is the equivalent of a garbage disposal when it comes to this food! He completely stopped eating his old brand of dry food and we’ve tried numerous other dry foods and he LOVES this food he’s like a whole new dog after switching to Wellness Core RawRev his coat is shinier, allergies seemed to disappear upon the switch (not implying that this will happen to all dogs), energy level increased like he’s a puppy again!!! I can’t praise this food enough!!!! I use this as a topper and as training treats occasionally. My dog always gets excited when he hears the bag. He is notoriously picky and has a sensitive stomach. He has had NO stomach upset with these and loves his kibble now. I bought this when it was on sale to try it. My dogs loved it, even the picky eater. I wish I would have purchased more when it was on sale. My older dogs have stopped being interested in their food. I mix a little of this in and it gets them interested enough to start eating. 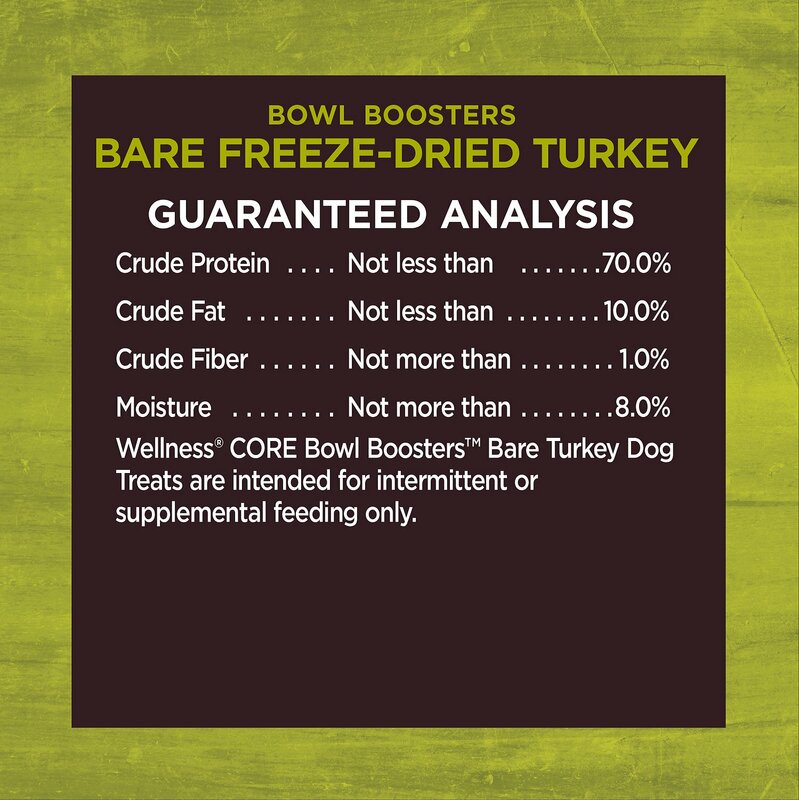 Love the Freeze Dried Turkey Dog Food Mixer by Wellness! This stuff is great and at a reasonable price vs. other freeze dried dog topers/mixers. She loves the freeze dried food added to her kibble! Makes eating enjoyable! My dog doesn’t love to eat. She is a rescue so I’m not 100% sure of her history. 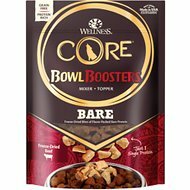 I have struggled to get her to gain weight so I bought these to mix in with her regular dog food. She can’t resist them! She doesn’t even wait for me to put her bowl down sometimes before she starts eating! Ever since I bought these she has done so much better eating. HUGE HIT WITH MY PUPPY PACK!!! I don’t have to google search the ingredients label. All three pups love them! Love, love, love them! If your dog is finikie about eating when they should this solves the problem. She now eats when it is put down and the amount she should eat. It is a healthy supplement that enhances her diet.